This very rare Cryptocoryne is recently collected in Palawan (Philippines). It proves to be an easy to cultivate plant. Midway in Palawan. 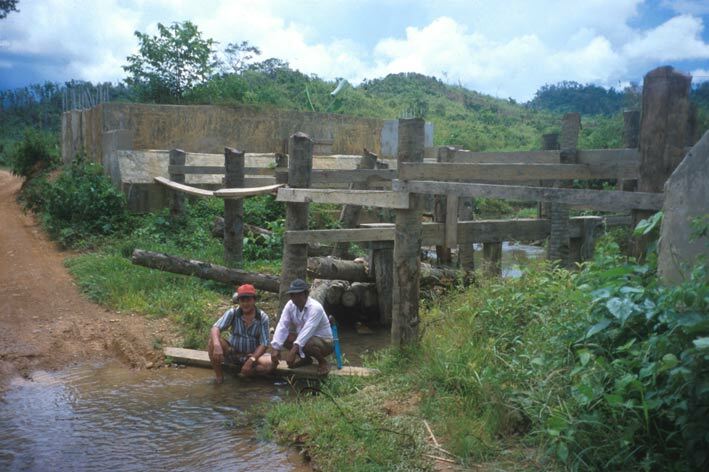 One had to cross small streams with or without bridges. My cotravellers Herson Morco (left) and Angel Espinosa resting for a while. coll. & cult. B793 A few meters downstream from the 'bridge' we found a few small patches of C. pygmaea. 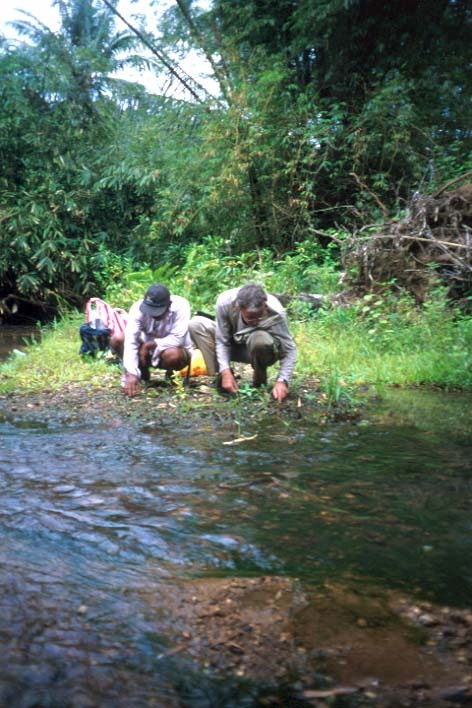 We didn't found anymore plants in this stream, but probably every stream will have these plants. coll. & cult. B793 C. pygmaea growing on the banks of the Labangan river on Basuanga, the main island of the the Calamian group between Mindoro and Palawan. 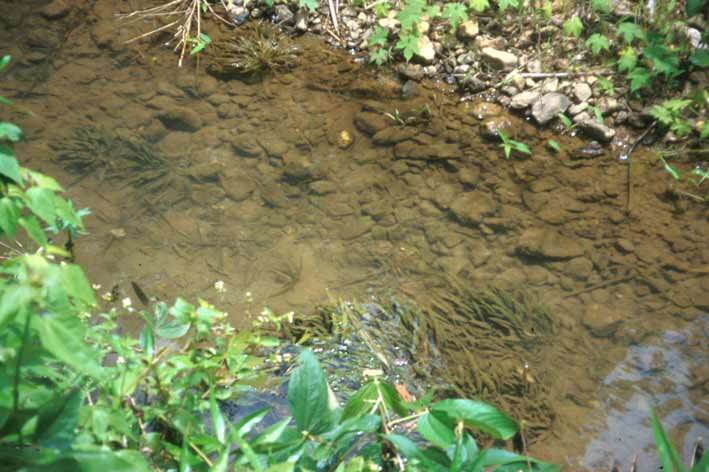 In the middle of the stream grow big specimens up to 25 cm. coll. & cult. B787 The same spot. 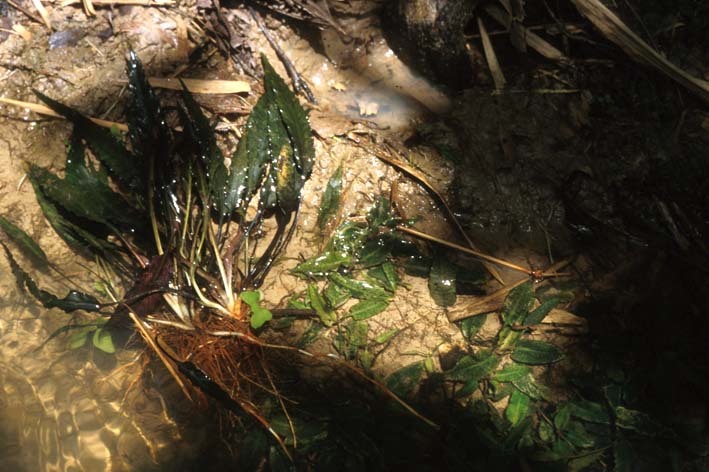 The big plants, reaching up to 25 cm, were collected in the streambed at c. 60 cm depth. There may be some tidal influence. At a few kms you could go for coral diving. 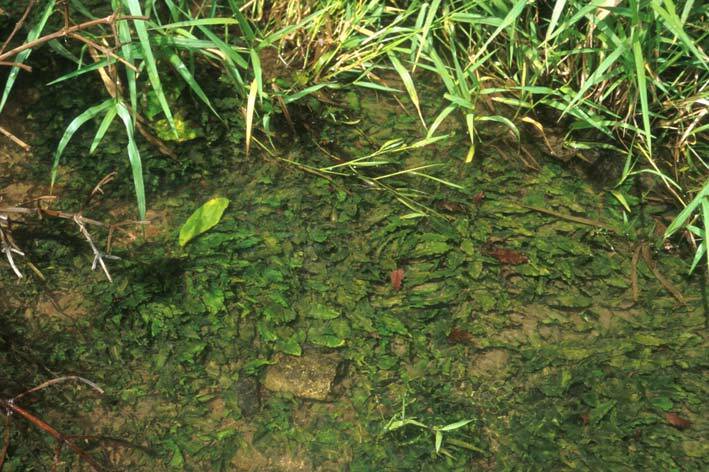 Another stream in Palawan with a big 'carpet' of C. pygmaea. Its a special feeling to walk over with your bare feet. coll. B791 A small stream near Lake Manguao (Palawan). 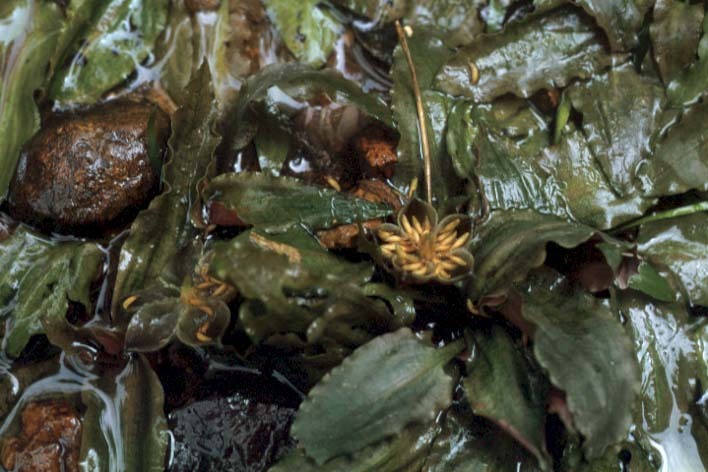 C. pygmaea grows in about 10 cm water. coll. B788 A digged out specimen. Note the fruit and the (damaged) spathe. Interesting is to see the strong, transverse ringed, contractible roots. coll. B789 Small patches of C. pygmaea growing near Sandakan (Palawan). 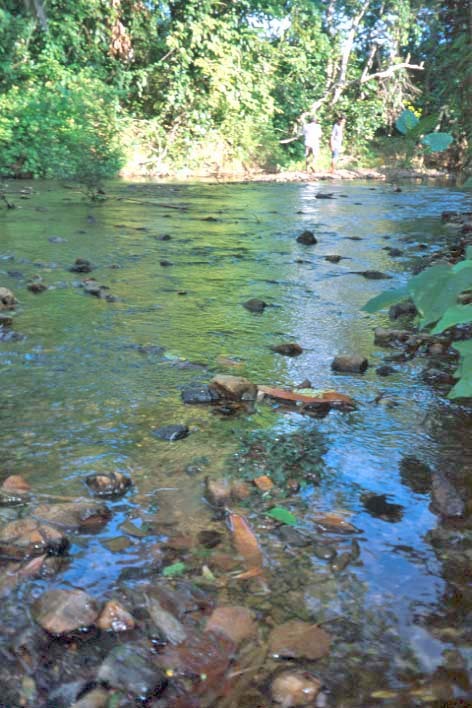 The bottom of the river is stony, the level may rise for more than 1 meter. 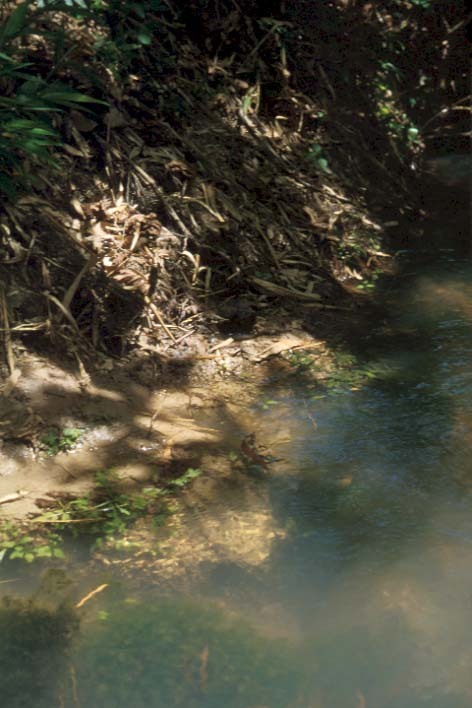 A stream NW of Taytay (Palawan) close to the sea. Angel Espinosa (left) and the author collecting spathe's and fruits of C. pygmaea. photo Morco An unopened spathe of C. pygmaea. Note the upright position of the limb. 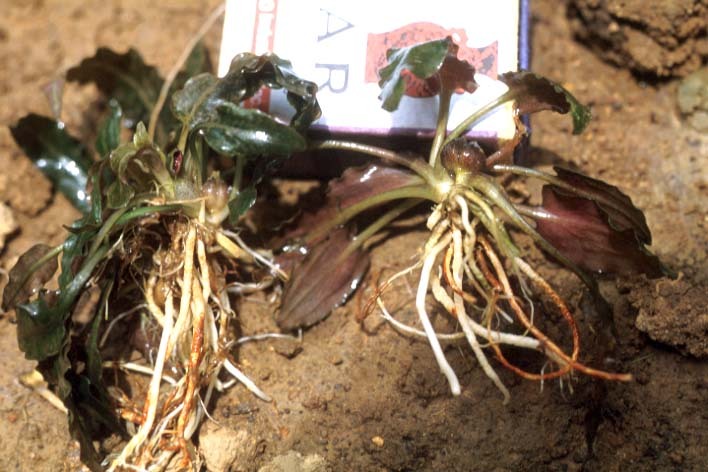 The plants grow rather deep buried into the soil (white parts). coll. B794 A close view on the bank (picture at left). Hundreds of fruiting plants growing at the moment emersed. Note the stony habitat. coll. 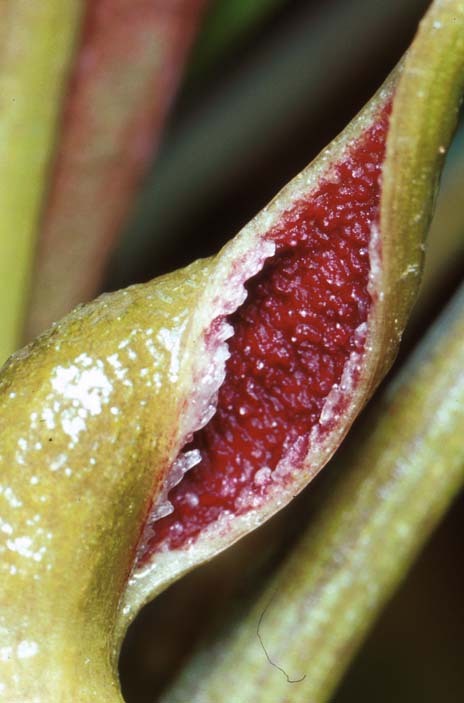 B794 An opened fruit of C. pygmaea. The seeds are visible and ready for distribution. They will germinate immediately. 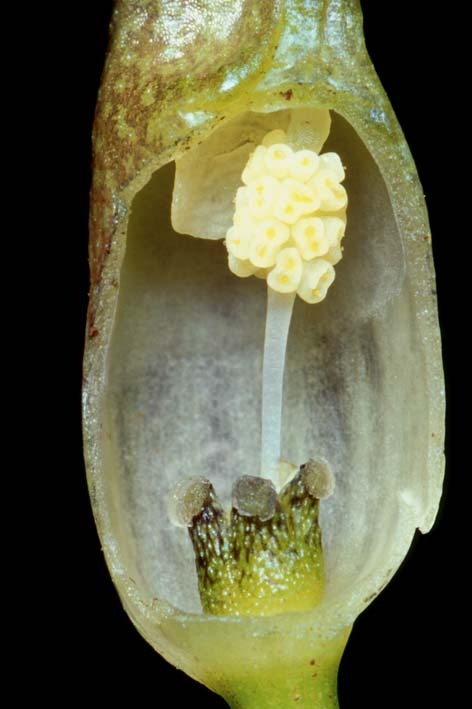 An unopened spathe of a cultivated specimen of C. pygmaea. This one has again the oblique position of the limb. photo van Wijngaarden This cultivated specimen also shows the oblique position of the limb. However the limb opens up to the end. Note the reddish hue on the lower surface of the leave. photo van Wijngaarden Detail of the picture at left. Note the rough inner surface of the limb. 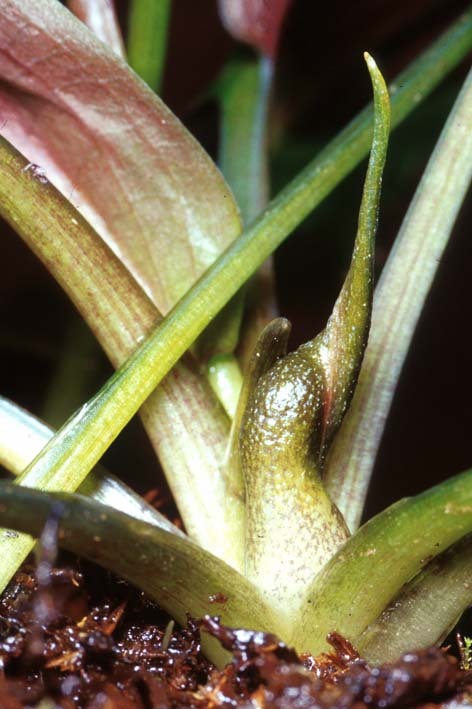 A collar is not present in C. pygmaea. The overall length of the spathe is 3 - 4 cm. photo van Wijngaarden Cultivated specimen of C. pygmaea. The limb of the spathe opens wide. The oblique position of the limb is apparently not typical. 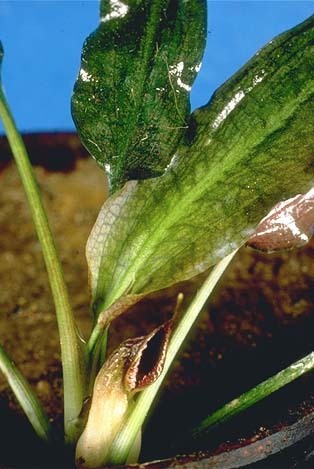 A normal developed spathe of C. pygmaea. coll. & cult. B789 Length section of the spathe showing the inner side of the limb and the flowers. coll. & cult. B789 A cultivated specimen of C. pygmaea, flowering with only the limb of the spathe above the ground. photo van Wijngaarden Opened lower part of the spathe, the kettle. 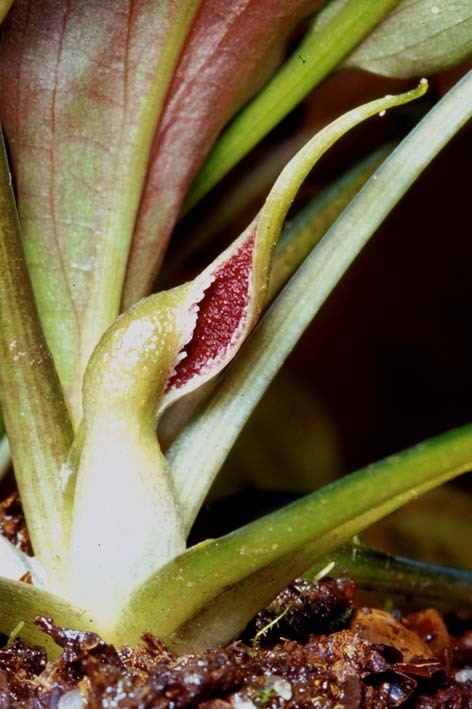 The female flowers (lower part) seem to be poorly developed. The first known photograph of (a cultivated) C. pygmaea (Jacobsen 1982). 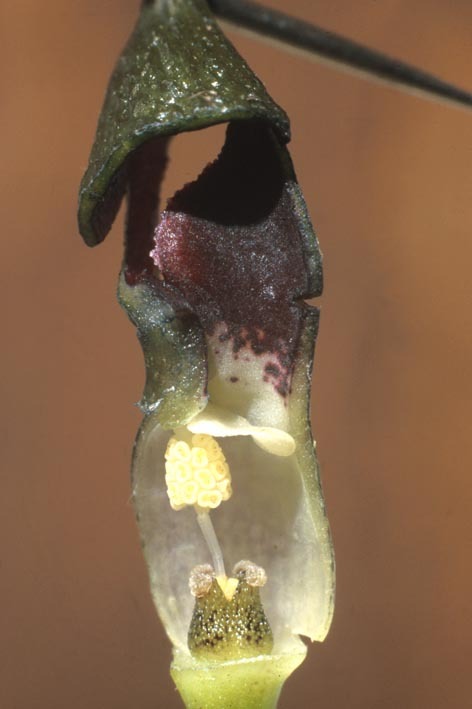 Note the small sideward opening and the small tail of the spathe. 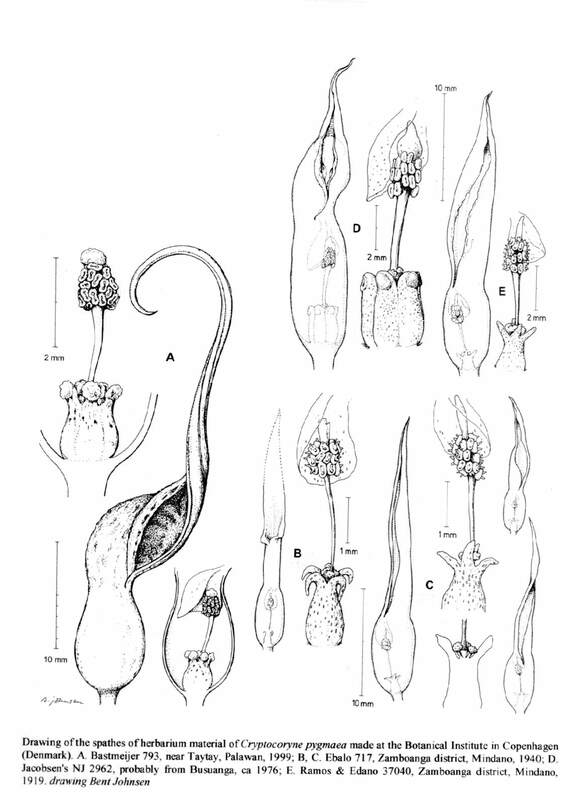 photo Jacobsen Drawing of Jacobsen's plant (see left) of C. pygmaea in de Wit (1990). drawing Ike Zewald All known collections of C. pygmaea. Read the text under the full picture for explanation (Bastmeijer & Morco 2000). drawing Bent Johnsen Distribution of C. pygmaea in the Philippines. 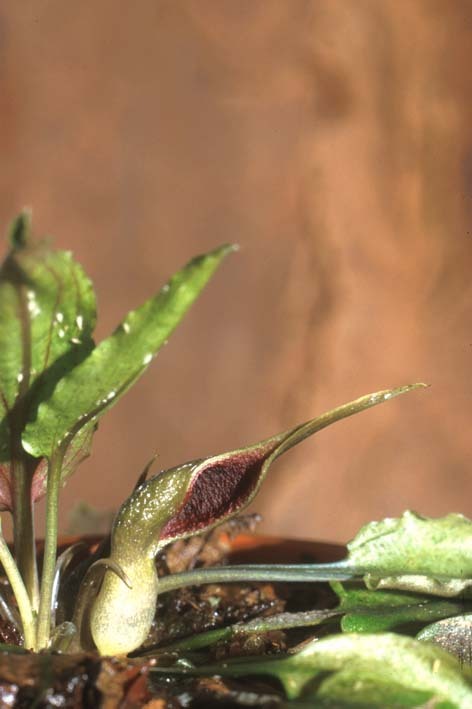 Cryptocoryne pygmaea was only known from herbariumsheets till ca 1970 when Niels Jacobsen discovered an unknown plant in a shipment of C. aponogetifolia's from the Philippines to Copenhagen. He could identify this plant as C. pygmaea, using the old herbarium material from Kew (the Manila sheets were destroyed in WW2). 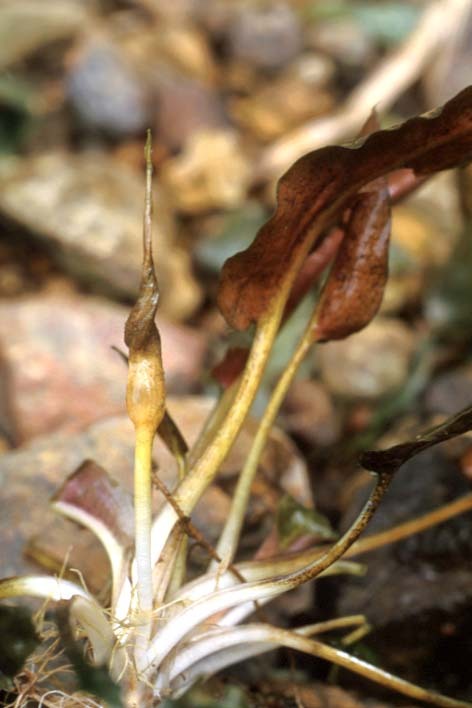 Until then most authors regarded this plant as a synonym for C. auriculata (from Sarawak). The unknown origin of this plant is cleared up during my trip with Herson Morco (Morco International Aquatics, Manila, Philippines), may 1999. We could find the former locality at Busuanga island (Calamian group, halfway from Mindoro to Palawan) from where local suppliers send plants to Manila where there were shipped together with C. aponogetifolia. 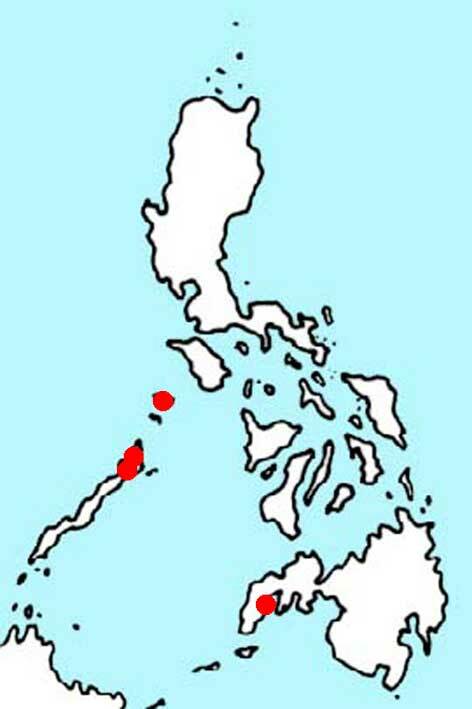 Localities of C. pygmaea are known from West Mindanao and Palawan. In 1984 a botanical expedition to Palawan, sponsored by the Hilleshög forestry (timber) company, revealed a confirmation of the 1905 collection of Merrill. C. pygmaea was found near Lake Manguao (= Lake Danao). But no live material was brought back. 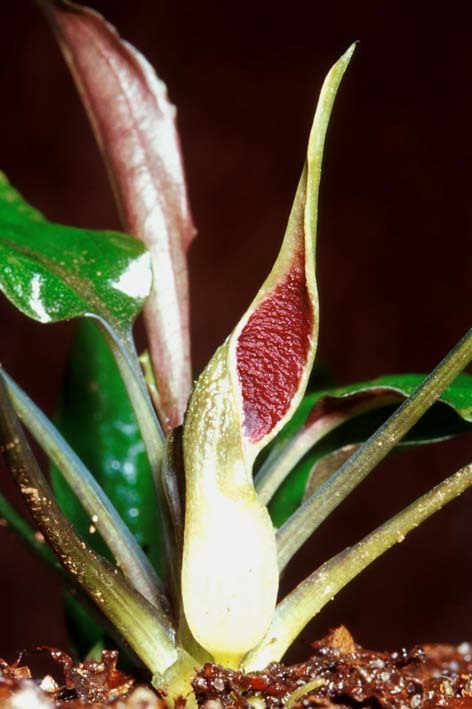 During our 1999 trip we found a lot of new localities for C. pygmaea in the Northern part of Palawan. They do not grow only on the banks (small specimen, ca 5 - 8 cm height) but also in deeper water, where they can grow up to 25 cm. The first results in cultivation show some variation in the spathe and the leaves. It also proves that C. pygmaea is good aquarium plant. Arends, J.C., J.D. 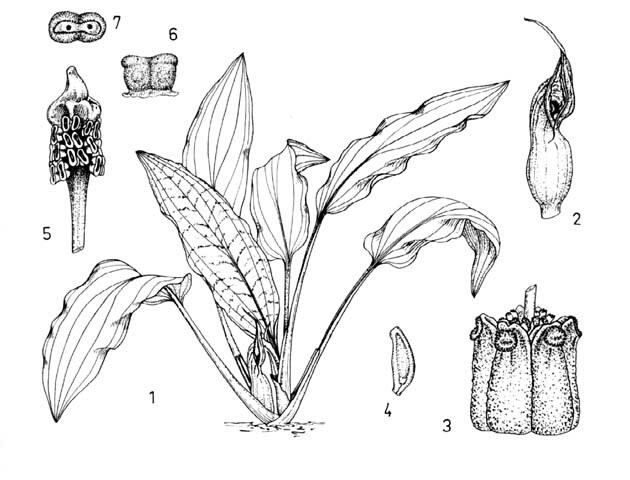 Bastmeijer & N. Jacobsen, 1982.Chromosome numbers and taxonomy in Cryptocoryne (Araceae).II. Nord.J.Bot. 2 : 453-463. Bastmeijer, J.D. & H. Morco, 2000. Cryptocoryne pygmaea Merrill (Araceae) von Busuanga und Palawan (Philippinen). Aqua Planta 25(3): 99-107. Hilleshog Forestry AB, 1985. The Palawan Botanical Expedition Final Report. Jacobsen, N., 1982. Cryptocorynen. Alfred Kernen Verlag, Stuttgart. Merrill, E.D., 1919. New or noteworthy Philippine plants XV. Philipp.J.Sci. 14(4) : 370-371. Merrill, E.D., 1921. 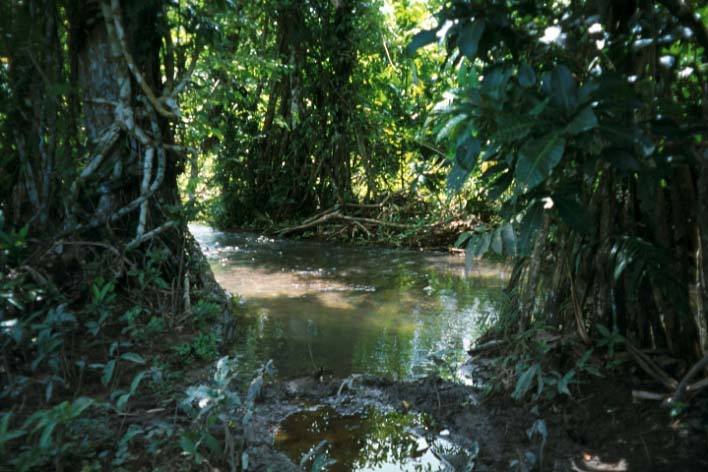 A Bibliographic Enumeration of Bornean Plants. Journal of the Straits Branch of the Royal Asiatic Society : 106-109. Merrill, E.D., 1925. Cryptocoryne. An Enumeration of Philippine Flowering Plants 1 : 189. Sadilek, V., 1972. Neue Cryptocorynen VIII : Cryptocoryne auriculata Engler. DATZ 25 : 56-59. Schulze, J., 1978. 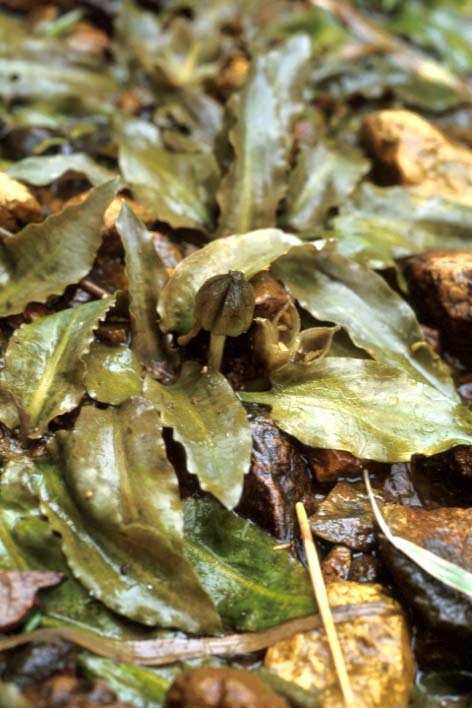 An den natürlichen Standorten von Cryptocoryne aponogetifolia Merrill in de Philippine. DATZ 31/9 : 310-314. Wit, H.C.D.de, 1959. 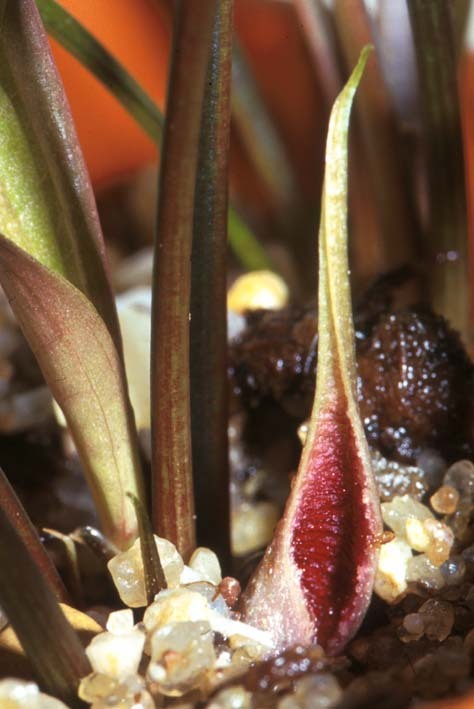 Het genus Cryptocoryne 8. Het Aquarium 30(2) : 36-40.